The tribes enter what seems like a typical Reward Challenge but this season is called "Game Changers" so they have to switch it up again. The castaways draw buffs to divide into two tribes and Debbie is the odd-woman-out, heading to Exile Island. 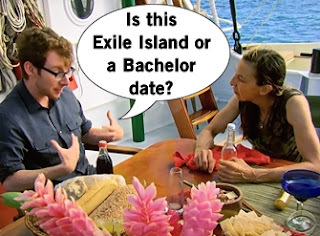 But Exile Island is actually heaven: it's a boat picnic with former Survivor champion, John Cochran! There are no roses to be handed out on this date, but instead some advice which Debbie sort of heeds. She also gets to choose between an immunity challenge advantage for her tribe or double votes, so she takes the cursed double votes. But Debbie is very confident in her game so it's not surprising. On newer Mana, Brad and Troyzan feel outnumbered by the women which must give some major One World flashbacks for ol' Troyzan. The two men quickly rally, hoping to keep working with Sierra, while searching out a fourth. On newer Nuku beach, Sandra and Varner are totally outnumbered and feeling a little threatened. Sandra is clearly the #1 target on the beach so the majority concocts a plan that they're targeting Tai because he can find idols. And they're not wrong because that dude is has two idols now. Yup, he solved his Mana beach clue and find that idol, then re-used the well location clue to unearth the Nuku beach idol. Man, Tai's idol crotch bulge is going to be insane. Nuku loses the Immunity Challenge, so the group keeps up the ruse that they're voting for Tai which Varner buys and Sandra's hesitant about. Surprise, surprise though: Tai blabs the wrong plans in front of Varner which tips off Sandra. 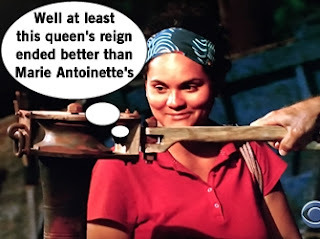 Sandra, the two-time winner, isn't giving up and tries to calmly persuade the tribe to save her and vote off Tai, warning that the Kaoh Rong three could reunite. It's a masterful argument that Sarah, Ozzy, Zeke, and Andrea can see through but respect it. Tribal Council time! Debbie gets a front-row seat to her future tribe's first elimination, which is definitely a messy disaster. Since everyone is a "big threat" there's discussion about what is considered a target. Sandra is very aware tonight is likely her last since no one talks strategy her. Tai thinks he's in trouble because he made a big move taking out Malcolm, but then he keeps rambling too much and then says the only name he heard for the night is Sandra. Then Tai says he's going to vote out Ozzy and the majority is so confused if Tai is blowing all their plans, wondering if they can even trust Tai and maybe he needs to go. Despite this blunder, the majority sticks together and for the first time ever Sandra is eliminated from Survivor. The group gives the queen a round of applause as Sandra experiences her first torch snuff.